This funding is exceptional for several reasons. First, Venezuela does not meet the grant eligibility requirements for upper-middle-income countries, but the Global Fund is making an exception in this instance. Second, because it is the first time Venezuela is receiving support from the Fund, and third, because the support comes in the form of a donation rather than a grant. The Global Fund Board approved the funding on 24 September using electronic voting. In so doing, the Board endorsed a 24-page proposal developed by the Secretariat in consultation with partners and civil society and recommended by the Strategy Committee. “The decision is the culmination of a concerted and unyielding effort by Venezuelan and global activists to push the Global Fund to show leadership in supporting countries in crisis,” ICASO and ACCSI said in a news release. ACCSI, or Acción Ciudadana contra el SIDA (Citizens Action Against AIDS) is a human rights organization in Venezuela. In the box below, we summarize the highlights of the Board’s decision. In the balance of this article, we provide some background information; we describe the proposal endorsed by the Board, including implementation arrangements, risk considerations and sources of the funding; and we present some reaction to the decision. Venezuela has been in a severe economic crisis since about 2015 due to falling oil prices. Oil accounts for 95% of the country’s export earnings. Venezuela has been hit by hyperinflation. According to BBC News, in July 2018 the annual inflation rate reached 83,000%. Prices have been doubling every 26 days, on average. This has resulted in many Venezuelans struggling to afford basic items such as food and toiletries. The Global Fund was first approached about the possibility of providing assistance to Venezuela on 6 June 2016 when the board of the Venezuelan Network of Positive People (RVG+) wrote to the Fund asking it to make an exception to its rules in order to provide urgent humanitarian aid for HIV and TB. Since then, civil society organizations (CSOs) have been relentlessly pushing for the Global Fund to provide assistance. Although the Global Fund expressed concern about the situation in Venezuela and said that it was prepared to support a regional response, the Fund did not agree to provide direct assistance to Venezuela –– until now. In May 2018, the Board adopted a policy (the Fund refers to it as an “approach”) on the provision of exceptional funding to countries in crisis that do not meet the Global Fund’s eligibility criteria (see GFO article). This policy paved the way for the decision to support Venezuela financially. Immediately after the policy on exceptional funding was adopted, the Secretariat launched an assessment of the situation in Venezuela. Meanwhile, in June 2018, the Pan American Health Organization (PAHO) and UNAIDS undertook a technical assessment of the critical gaps in programming for HIV, TB and malaria. Also in June, PAHO and UNAIDS developed a Master Plan (Plan Maestro para el fortalecimiento de la respuesta al VIH, la tuberculosis y la malaria en la República Bolivariana de Venezuela desde una perspectiva de salud pública) which has been endorsed by the Venezuelan Ministry of Health, for the strengthening of the response to the three diseases. The plan covers a three-year period. To facilitate decisions by donors on potential funding, the interventions in the plan are prioritized. According to the proposal developed for the Board, the Master Plan estimates that the cost to strengthen HIV, TB and malaria programs, and to ensure continued treatment and diagnosis, for a three-year period, is $122.0 million. Most of this cost, approximately $100.0 million, is for HIV; just over half of the HIV costs are for ARVs. The estimated costs for TB and malaria, respectively, amount to $5.1 million and $16.0 million. Editor’s Note: The Master Plan has not been released publicly. All references in this article to the contents of the Master Plan are based on information contained in the proposal prepared for the Global Fund Board. 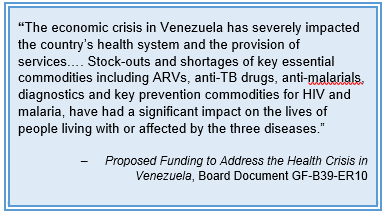 The Secretariat concluded (and the Strategy Committee agreed) that the health situation in Venezuela meets the criteria for funding contained in the policy on exceptional funding. The proposal prepared for the Board said that the funding represents “a short-term humanitarian response.” The Global Fund acknowledged that the available funding is insufficient to meet more than a fraction of the total need. “More fully addressing the health needs of the Venezuelan people will require additional commitments from other donors and partners in the near term, and ultimately a resolution of the economic and political situation so that the Venezuelan government can provide for the health of its people,” the Fund said. 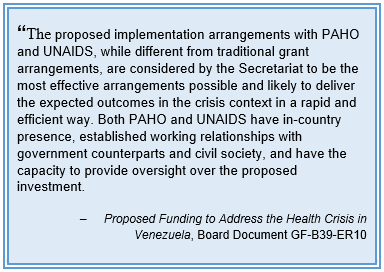 The Board decided that of the $5.0 million donation, $4.9 million will be used to purchase antiretrovirals (ARVs) through the PAHO Strategic Fund; and that the remaining $100,000 will be used to support civil society organizations (CSOs) in Venezuela to provide oversight and monitoring of the delivery of ARVs to patients. The Strategic Fund is a regional pooled procurement mechanism for essential medicines and health commodities that procures on behalf of member states. The fund, which has been operational since 2000, currently has 33 participating countries. The Global Fund has received no official request for assistance from the Government of Venezuela. However, in March 2017, the government officially requested help from the United Nations to regularize the supply and distribution of medicines. According to the proposal prepared for the Board, the $5.0 million donation will provide support for an initial 12-month period. This is consistent with the policy on exceptional funding adopted earlier this year. That policy set a ceiling of $20.0 million for support (for all countries combined) provided during the 2017–2019 allocation period. The $4.9 million will supplement other funds that organizations in Venezuela have received from other donors to procure ARVs for the existing cohort of patients. The $4.9 million will be channeled directly to PAHO for procurement through the Strategic Fund. The Government of Venezuela has been using the Strategic Fund to procure medicines since 2010. The $100,000 for CSOs will be routed through UNAIDS to strengthen the capacity of CSOs to continue to advocate for people living with HIV; to monitor access to care and treatment and the delivery of ARVs at the national and sub-national levels; and to strengthen the CSOs’ coordination with the National AIDS Program. The Global Fund will enter into a contribution agreement with UNAIDS, which has agreed not to charge any overhead or direct costs. Under the agreement, UNAIDS will support CSOs to prepare reports and analyze stock levels at distribution sites. UNAIDS will also, as needed, perform checks at central or regional warehouses to verify stock levels after the ARVs are delivered. UNAIDS will provide three quarterly reports on these activities, prepared with input from CSOs. The Global Fund expects that this support will facilitate the establishment of a mechanism for CSOs to work with the National AIDS Program on the oversight of drug delivery in Venezuela that will endure beyond the period of the $5.0 million donation. The proposal prepared for the Board noted that the Secretariat does not anticipate that the health situation in Venezuela will improve in the near or medium term. The proposal emphasized that the $5.0 million is a donation and not a grant. Exceptional funding, such as that which the Global Fund has provided to Venezuela, requires implementation arrangements that are different from standard practice. For example, there will be no country coordinating mechanism or local fund agent providing oversight. In addition, the Office of the Inspector General (OIG) will not be able to provide the usual degree of assurance, through audit or investigation work, with respect to how the funds were spent. For instance, the funding arrangements do not provide the Global Fund unrestricted right of access to books, records, personnel or sites relating to the funded activities, including as required under the OIG Charter. PAHO has not agreed to grant the Global Fund access to its books, records, or sites, or those of its suppliers. UNAIDS has not agreed to grant the Fund access to its books and records. Nor has UNAIDS guaranteed its collaboration for accessing sites and personnel. However, UNAIDS has agreed to ensure Global Fund access to the books and records of any contracted CSOs receiving money from the Fund. The proposal prepared for the Board stated that the Global Fund will enter into a contribution agreement with PAHO, under which PAHO will be responsible for procuring ARVs through its Strategic Fund and delivering the commodities to the port of entry. The PAHO office in Venezuela will, in coordination with the Venezuelan government, clear the ARVs through customs and facilitate the transfer and delivery of the ARVs to the central warehouse. The National AIDS Program will be responsible for ensuring delivery from the central warehouse to Venezuela’s 51 dispensary sites. PAHO will also support the National AIDS Program and the Ministry of Health to quantify their ARV needs and develop procurement and distribution plans. To support PAHO’s ongoing efforts and collaboration with respect to the Global Fund’s donation, the Fund has agreed that PAHO may receive $208,250 of the approved funding of $4.9 million. At the same time, PAHO has agreed to waive its standard 13% overhead charge. The proposal said that neither PAHO nor the Global Fund will have any legal agreement with the government of Venezuela, and that PAHO’s responsibility for the commodities extends only to delivery to the central warehouse. The proposal pointed out that the requirement to provide a rapid and efficient response in the context of the crisis in Venezuela entails significantly higher levels of risk and lower levels of assurance. By approving the $5.0 million donation, the Global Fund has accepted these risks. They cannot be fully mitigated under the proposed implementation arrangement, the proposal stated. For example, accountability for the proposed investment is limited to the procurement and delivery of commodities to port, customs clearance, delivery of commodities to the central warehouse, and some downstream monitoring activities. Distribution of the ARVs to intended beneficiaries will be the responsibility of the government, which will have no formal obligation to complete the distribution. According to the proposal, there is no dedicated source of funds within the 2017–2019 allocation period for non-eligible countries in crisis. Therefore, the $5.0 million will be taken from available sources of funding identified by the Audit and Finance Committee (AFC). In July 2018, the AFC undertook a review of available sources of funding and declared that $144.9 million was available for portfolio optimization. At the same time, the Secretariat undertook a thorough review and prioritization of the interventions on the UQD Register. Through the Grant Approvals Committee, the Secretariat decided to award $127.7 million of the available $144.9 million to fund interventions in the UQD Register that it deemed to be critical and time-sensitive. When the Secretariat put together the proposal to donate $5.0 million to Venezuela, it assessed the proposed donation against the unfunded needs of countries currently receiving Global Fund support as expressed by the interventions in the UQD Register. According to the proposal, the Strategy Committee and the Secretariat weighed the trade-offs involved in investing in eligible countries versus providing support for Venezuela. They concluded that while there remain clear gaps in the portfolios of eligible countries, the most critical and urgent needs for 2018 and 2019 are able to be filled with the $127.7 million in awarded funds. The Strategy Committee and the Secretariat further reasoned that because the first grants emerging from the 2017–2019 allocations had only been implemented for about seven months, there will be considerable opportunities to identify additional efficiencies in the next year or two. This should allow for additional interventions in the UQD Register to be funded at later dates. Consequently, the proposal stated, the Strategy Committee and the Secretariat are comfortable recommending the use of $5.0 million from available funding for portfolio optimization to support the proposed response to the health crisis in Venezuela. At the same time, the proposal stated that in future, weighing of support for countries in crisis against UQD needs may be more challenging. Reaction to the donation from the Global Fund has been generally positive. On 21 September 2018, Glassman co-authored a blog (with Roxanne Oroxom, also from the CGD) on the situation in Venezuela. Last May, Taraciuk published an article on the need for the Global Fund to take bold action with respect to the situation in Venezuela. The decision by the Global Fund Board to donate $5.0 million to Venezuela includes a call for relevant partners, donors and other stakeholders to further support a regional response to the health crisis. According to the proposal prepared for the Board, the Global Fund’s policy on non-eligible countries in crisis has generated interest from other donors and partners. As a result, the Secretariat, together with partners in the region, is planning an initial donor roundtable to be held in early October 2018 to discuss the HIV, TB and malaria situations –– and, possibly, some broader health systems issues –– as well as to develop a coordinated support mechanism, and to determine ways to support the country and the region affected by the influx of people leaving Venezuela. GFO has written extensively about the situation in Venezuela. The most recent article, from 12 May 2018, is available here. The full text of the Board decision, Document GF-B39-EDP11, will likely be posted shortly on the Global Fund website here. However, if the Global Fund follows past practice, the proposal prepared for the Board, Document GF-B39-ER10, will not be posted. Although the Fund has regularly posted papers prepared for in-person Board meetings (once the meetings have been concluded), it has not been in the habit of posting Board papers related to electronic decisions.